When it’s time to add all the finishing touches to a room I’m working on, I’m so excited to decorate the completed space that it’s like putting candles on a birthday cake. I find it so easy to imagine enjoying the finished space that I’m anxious to get it all done. That’s why I hate it when I have to backtrack and fix something — but it happens. I think we’ve all been up on a stepladder trying to snap a set of blinds into place only to realize they don’t quite fit and you’ve got to uninstall and reinstall the hardware again. 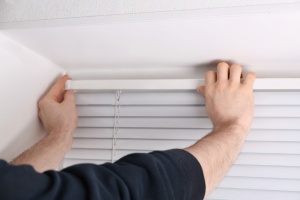 Follow these steps to make sure your finishing touch moment goes smoothly the next time you hang blinds. Do you want to mount your blinds inside the window frame or outside of it? You’ll need to know in order to measure correctly. Traditional inside mounts are very neat, but they don’t work for every window. If you have a narrow window frame, the bracket that holds your blinds might not fit on the frame. Check your chosen blinds’ “mounting requirements” to see how much space you need. If you don’t have enough space inside the frame, then you’ll want an outside mount. You can also choose an outside mount if you’d like a larger set of blinds, which also make your window appear larger. Inside Mount: Measure exactly and don’t be tempted to add or subtract anything. Round down to the nearest 1/8 inch if you are in between measurements. Trust the factory professionals to make sure your blinds fit the window. Record your measurements as Width x Height (W x H) – record them as such as to not mix up your numbers. Width: Measure the width of the window at the top, middle and bottom, then use the narrowest measurement. Some windows look level, but they aren’t always perfectly square. Measuring all the way down the window ensures you won’t have any gaps in coverage. Height: Again, measure in more than one spot using the left, center and right areas. Use the shortest measurement. Outside Mount: Your blinds can be as wide as you want and as long as you want — you get to decide. If you want to block out light or have more privacy, then go wider. Measure the area carefully to determine the exact measurements then add additional height for your mounting brackets, ensuring you have at least 2” of wall space above the molding or frame. This is a stress-free trick. I find it is so much easier to install the blinds if I take my time. I unpack the box and unwrap the contents. Laying out all the parts on a blanket or sheet not only makes me familiar with them but keeps me from hunting for something. Even if you’ve installed blinds before, read over the enclosed instructions so you follow the steps in the correct order. If you want an easy installation, put your brackets all the way toward the front of your window opening. Another trick of mine is to start my screw holes before I try to turn the screws. You can do this by either tapping the screw with a hammer to make a small hole or by starting small holes using a drill. This makes it easier to place your screw in the starter hole and turn it firmly. Finish one side, then do the other, and add any additional support brackets afterwards. The valance adds the finishing touch to your blinds, but you can’t wait until you are finished to think about it. Before trying to install your blinds, add the valance clips to the front. Otherwise, you’ll have to take the blinds back down to perform this step you skipped. Additionally, make sure the clips aren’t touching any mechanisms responsible for working the blind. Now that your brackets are up, you’re on to the fun part. Simply slide the blind into the opening in the brackets you’ve installed. Press up on the lower bracket while closing the upper cover until it snaps into place. Snap the valance into the clips you already installed. To make it easy, place it in the bottom clips first and then into the top clips. By following these five easy tips, hopefully you’ll hear that “snap” of victory on the very first try. 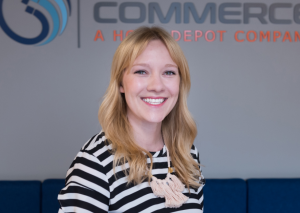 Abigail Sawyer is a Senior Social Media Specialist for Blinds.com. She’s a home improvement junkie who is currently restoring a 1972 cottage. Abigail writes on window treatments of all kinds, from choosing shades for a child’s room to hanging blinds right the first time. You can find a wide selection of faux wood blinds for your next home décor project on the Blinds.com website.